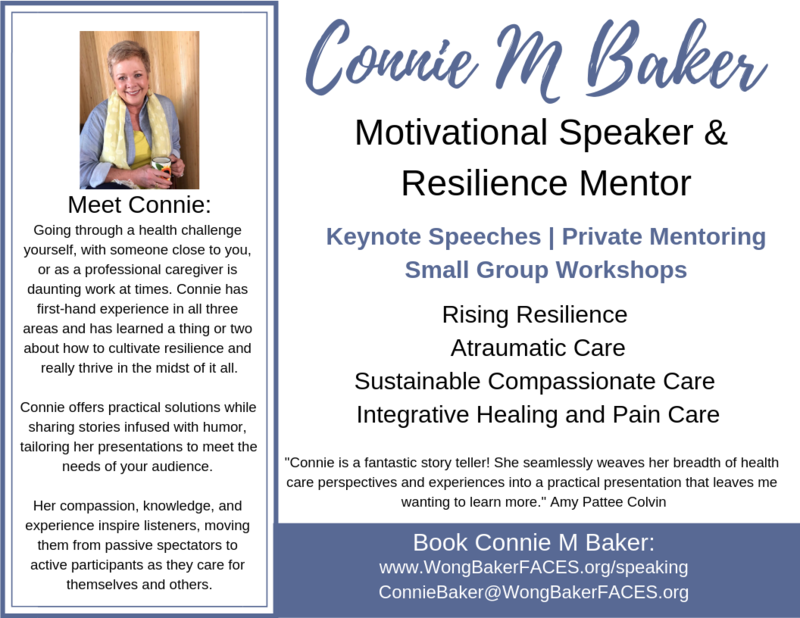 Addressing audiences of healthcare professionals, caregivers, and people navigating illness, Connie is a popular speaker, offering a range of practical techniques for pain assessment, pain management, and minimizing trauma and anxiety in medical settings. Connie is a natural storyteller and infuses her talks with humor. She engages her audience in ways that move them from being passive spectators to active participants. Her compassion and knowledge empower audiences to make a difference in the lives of people experiencing illness or caring for ill loved ones. She helps all audience members remember they are best able to help others, by first taking care of themselves. Connie has experienced being a caregiver in hospitals as well as for family and friends. She is now a breast cancer survivor, and her own illness deepened her understanding and appreciation for both sides of the care equation. To have Connie Baker speak at your next event, please complete the below form. We will be in contact with you promptly to provide information on Connie’s availability, fees, and services, and to answer any questions you may have. I would love to tour your facility and learn about the amazing ways you make a difference in the lives of the people you serve. If you have programs you would like to highlight, it may be possible to record a podcast session for FACES of Pain Care while I'm with you. Fill out the form below to get started. I look forward to working with you! Download a printable copy of the above speaker flyer here.